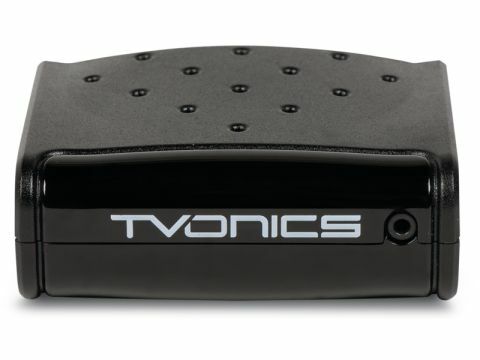 The TVonics MFR-300 allows users to convert an ageing analogue TV to digital without the need for a Scart, which explains the absence of such an output on the rear. Instead, there are two RF connections, one of which accepts your aerial feed and the other outputs a modulated digital signal to the coaxial input on your TV. But you can also send better-quality pictures via the AV output on the front using an optional composite/ stereo audio-to-3.5mm jack cable. It's oddly stylish, with an all-black ﬁnish and an opaque fascia that allows a red/green power light to twinkle through. If you want to hide the unit away, there's an infrared extender that plugs into the rear. Because there's no Scart output, setup takes a little longer than usual. After you've hooked it up, you have to ﬁnd a spare analogue channel on your TV and tune it to channel 38 (or to a channel of your choice) and you'll need to go through the same process on your analogue recorder if you want to loop it though that. But once you're up and running a ﬁrst-time auto tuning mode ﬁnds all the TV and radio channels quickly. Comically, the remote is twice the size of the unit and is let down by some awkward, sticky buttons, but they're clearly labelled and the menu controls are well placed. Towards the bottom is a button that instantly brings up a screen saver, which is fairly unusual. The onscreen design is attractive. The eight-day EPG is superimposed over live TV and laid out in the horizontal timeline style with quite a jazzy, modern look. The info banners are informative and instantly show the programme synopsis, but it's limited to now and next information and sometimes the current programme failed to update. The MFR-300 offers everything else you'd expect from a Freeview box – digital text, interactive support, subtitles, channel list editing and a timer mode, which switches to a scheduled programme when it starts. It also supports Audio Description, which is given its own button on the remote, and a user-friendly Help mode. In action the MFR-300 is fast to respond, with instant channel changing and smooth menu navigation, plus digital text pages appear in reasonably quick time. As for picture quality, the lack of a Scart output with RGB output means Freeview channels don't look as bold or crisp as we've grown used to, but it's much improved via the front AV output. When viewed on a 40in LCD, edges tizz, colours bleed and the picture is susceptible to interference and noise, but this is only to be expected from an RF output, and when viewed on the sort of screens that don't have a Scart input you're not likely to worry too much about artefacts like this anyway. Colours look impressive and fast movement is reproduced without much evidence of pixel noise or break up. And you can't complain about the crisp, distortion-free sound either. With its limited sockets, the TVonics MFR-300 is a Freeview receiver aimed at those with simple needs (and those that hate clutter) and is quite expensive for what it is. But otherwise it offers a surprisingly fulfilling experience – just don't expect miracles on the picture quality front.